During summer, it’s all about fruits and veggies. I love water-rich peaches, berries, tomatoes and cucumbers fresh from the farmers market or made into a quick salad. It just feels right when the sun is shining and the beach is calling. While I normally take my favorite Shun Nakiri knife and chop chop chop, this time I’m using a julienne peeler for a fun, quick alternative to slices and cubes. If you’re like me, kitchen gadgets are like books. You can never have enough, but you need a bigger house to store them all. Thank goodness this peeler from Kuhn Rikon is small, adorable and stays sharp for all your peeling needs. Lucky guy escaped the donation pile! I adore the asian flavors of miso, shoyu, sesame, and ponzu. 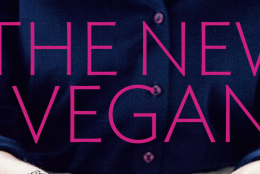 They also make for a needed respite from ranch and omnipresent vinaigrettes. Leftover dressing is great on tofu or tempeh. 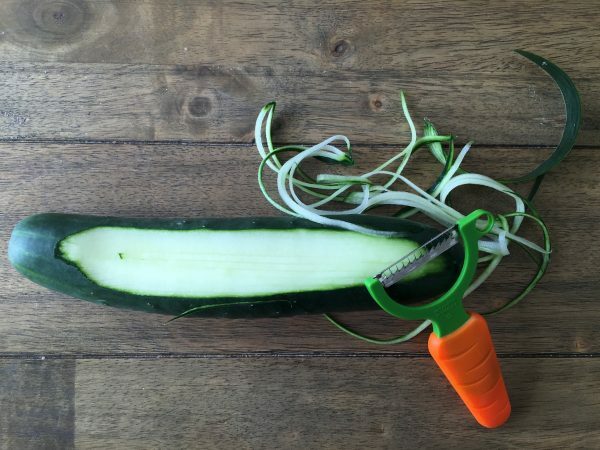 Using a julienne peeler, peel the cucumbers, avoiding the seeds. 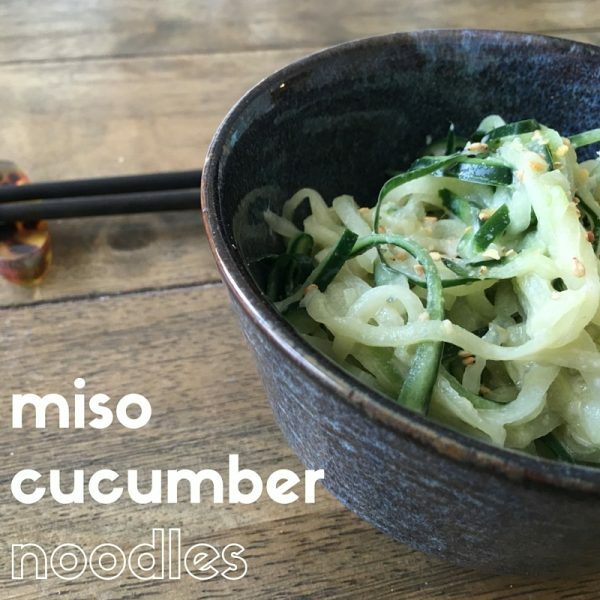 Place cucumber noodles in a colander and allow to drain while you make the dressing. In a small bowl, add remaining ingredients and whisk until smooth. 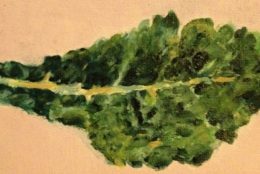 Add more water for a thinner, more dilute dressing. 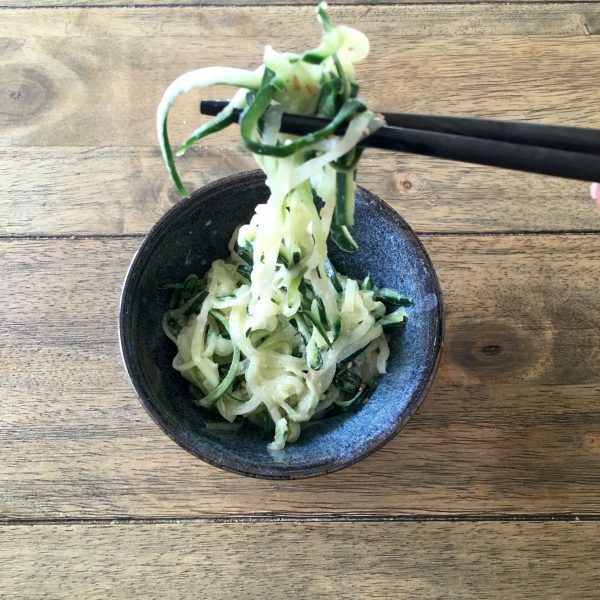 Squeeze cucumber noodles to get out excess water and place in a serving bowl. Add the dressing a little at a time to taste. You may have leftover dressing. 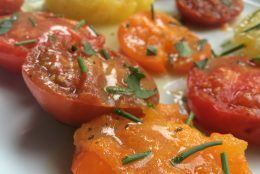 This looks like such a light and delicious dish– perfect for summer!